Blow Up is a below-average clone of Boulderdash from UK-based Eurosoft, who released a number of games for the MSX computer in mid-1980s. The game is the same dig-the-path gameplay you have seen in Boulderdash, mixed with a bit of Diggers, Soko-Ban, and jigsaw puzzle for good measure. You have five lives and only a limited number of special items to bail you out of tough spots. 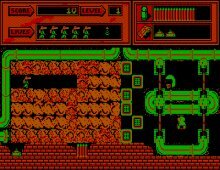 Some levels are nicely designed, but most of them look too similar to each other, and the pixellated CGA palette makes it difficult to tell the difference between rocks, pipes, and other terrain features. After you go through the first few levels, you will have seen all there is in the game. If you like Boulderdash, this little underdog doesn't really do it justice. Not recommended at all.